‘Lobster War: The Fight Over the World's Richest Fishing Grounds’ documents the effects of climate change on the lobster industry, as experienced by lobstermen warring with each other off the Maine coast. As climate change continues to warm the water of the Gulf of Maine, lobster populations are moving northeast and are exploding in the gray zone surrounding Machias Seal Island, an area claimed by both by the United States and Canada. The film "Lobster War: The Fight Over the World's Richest Fishing Grounds," which documents the struggle between Maine and Canadian fishermen for the lobster catch that has come to represent Maine, will be shown Sunday at Railroad Square Cinema in Waterville, featuring lobster fishermen and their boats from both sides. 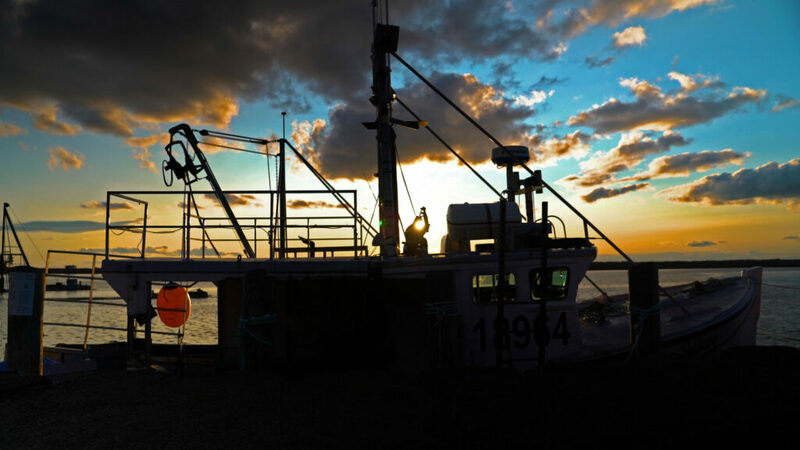 Photo courtesy of "Lobster War"
The waters off Machias Seal Island along the Maine coast are beautiful, but the war between U.S. and Canadian fishermen fighting over territory where climate change has caused the lobster population to explode is decidedly ugly. That conflict is portrayed in vivid detail in “Lobster War: The Fight Over the World’s Richest Fishing Grounds,” an award-winning documentary film co-directed and produced by David Abel, a Boston Globe reporter, and Andrew Laub, a writer, editor, filmmaker, cinematographer, visual effects artist and soundtrack composer. The film will be shown at 7:15 p.m. Sunday at Railroad Square Cinema in Waterville. Abel will engage in a question-and-answer session with the audience via Skype after the showing. The 2018 film focuses on the clash between the U.S. and Canada over 277 square miles of ocean off the 20-acre Machias Seal Island that both countries have claimed since the end of the Revolutionary War, according to Abel. U.S. lobster fishermen traditionally fished the so-called Gray Zone, but as the Gulf of Maine has warmed faster than nearly any other water body on Earth, the lobster population there has grown significantly, prompting Canadian fishermen to assert their sovereignty there, he said. Fighting between Canadian and American fishermen over the territory has been ongoing, with threats of violence and sabotage. Abel, an environmental reporter who has long covered fisheries issues, said in a telephone interview Wednesday that “Lobster War” shows how the warming waters of the Gulf of Maine are affecting lobster, Maine’s iconic species, whose population for the last 15-plus years has boomed, partly as a result of climate change. 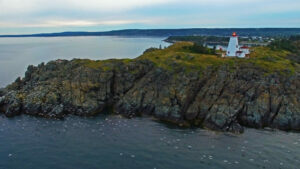 “My interest was in looking at how climate change has exacerbated this centuries-old dispute, because Canada and the U.S. both claim the waters around Machias Seal Island,” Abel said. Since the lobster surge and the value of the catch increased, the area has attracted more Canadian fishermen. Lobstermen on both sides have accused each other of stealing lines and gear and setting their traps on top of the other’s, according to Abel. One U.S. fisherman reportedly lost a thumb as he was trying to disentangle traps from Canadian lines. Abel was part of the team that won a Pulitzer Prize for breaking news in the Globe’s coverage of the Boston Marathon bombings. He produced and directed two films about the bombings. He and Laub also co-directed and produced “Sacred Cow,” a film about the collapse of the cod fishery in New England. Abel, of Boston, and Laub, of Philadelphia, completed “Lobster War” last summer after traveling numerous times to Maine and Canada to work on the film, which premiered last fall at the International Maritime Film Festival in Bucksport. The documentary was named runner-up to the grand prize at that event. It also won Best New England Film at the Mystic Film Festival. It is being shown at film festivals around the country and enjoying positive and enthusiastic response from audiences, according to Abel. Mike Perreault, executive director of the Maine Film Center, which owns Railroad Square, said he is looking forward to screening “Lobster War” Sunday at the cinema. Tickets are available online, in advance of the screening, at railroadsquarecinema.com, or at the door, according to Perreault. Regular admission costs $9.50. The charge is $7.50 for students and seniors. Abel, meanwhile, said he is excited that the 74-minute documentary will be screened in central Maine. “We’re thrilled that this great theater is going to be showing our film, and we hope lots of people come and get to appreciate the film,” he said. Dozens of people were interviewed on both sides for the documentary. People tend to talk about climate change in an abstract way, so it is often difficult to understand how it has affected people’s lives, according to Abel. But in the territory where the conflict is occurring around Machias Seal Island, climate change is not some abstract, theoretical issue, he said. Abel said he thinks anyone who lives in Maine should be concerned about the fate of lobster, on which the state has become increasingly dependent. Machias Seal Island is about 10 miles off the coast of Maine in the Atlantic Ocean and 12 miles from the Island of Grand Manan, which is part of New Brunswick. The U.S. and Canada both claim Machias Seal Island.